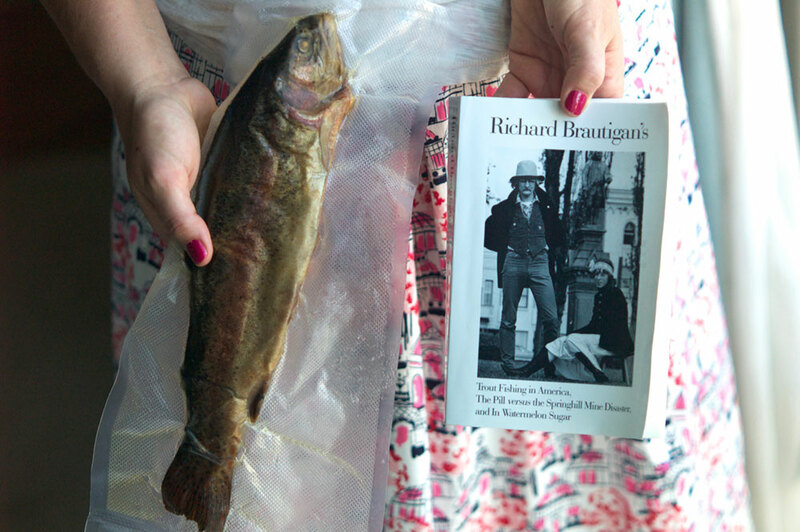 Brautigan achieved literary fame after his second novel, 1967’s Trout Fishing in America, captured the hearts of the counterculture and sold two million copies. 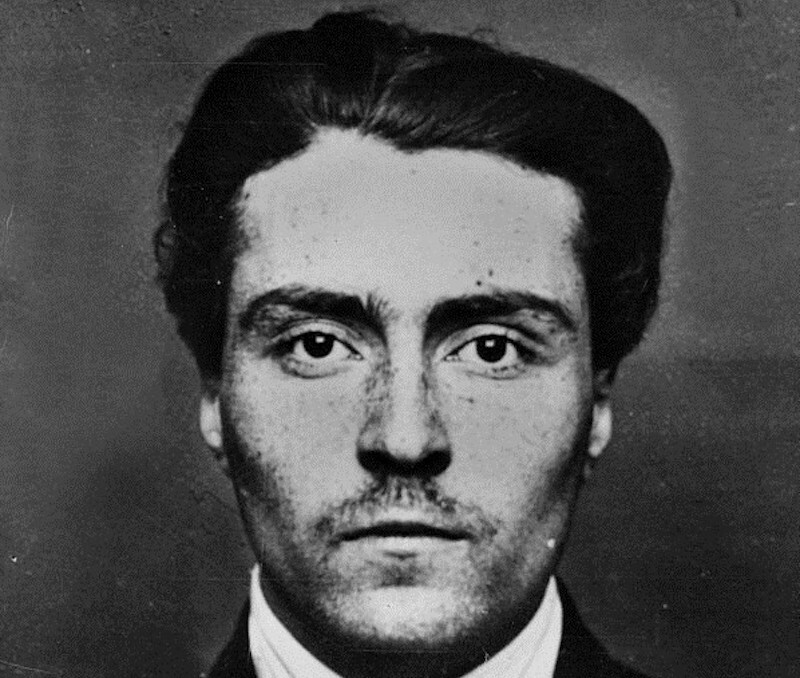 He went into decline in the late seventies and early eighties and died by suicide in 1984 at age forty-nine. 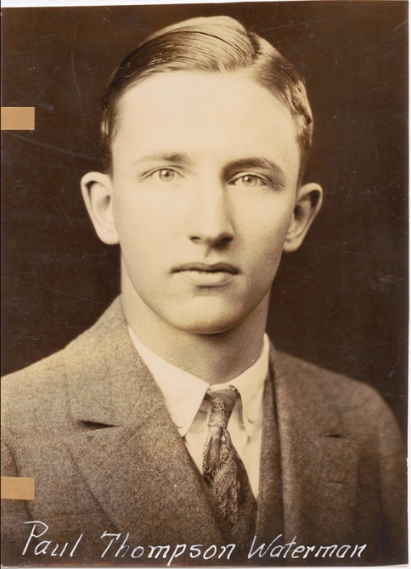 His books had a groovy design, which he controlled, and a kind of Hemingway-influenced minimalism. They’ve sometimes been called lightweight or dated, but his cult status has held nearly forty years after his death, so it seems his work will stand the test of time. 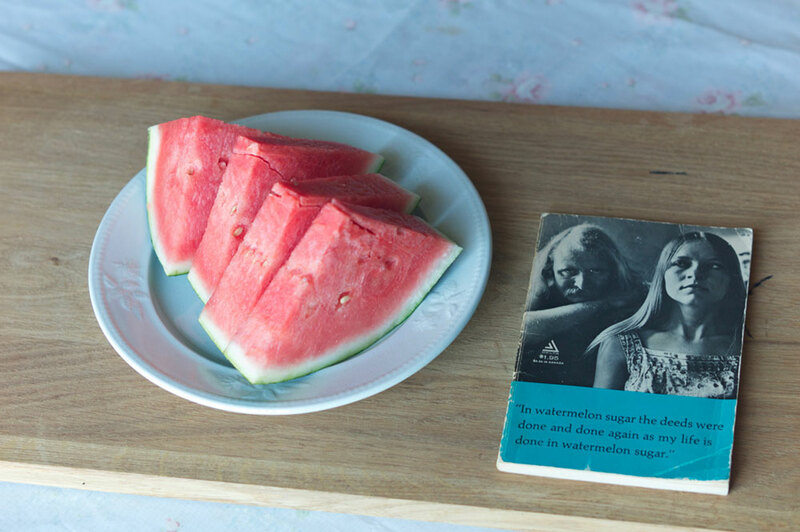 In Watermelon Sugar, my favorite of Brautigan’s books, is a funny little dislocated story about people living in a commune called iDEATH. 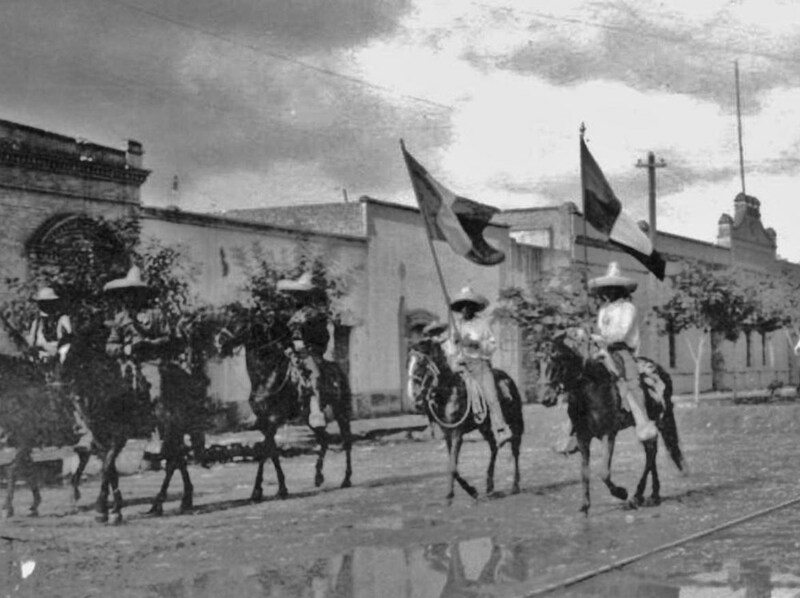 The novel’s plot, such as it is, concerns possessive and materialistic urges leading to tragedy. In this story, the mysterious substance of watermelon sugar makes up shacks, lives, a dress (which “smelled sweet because it was made from watermelon sugar”), a chair, a state of being, and many things besides. Mixed with trout oil, watermelon sugar powers lanterns and other machines. Its definition slips around, but Brautigan is saying that the things we love form an interchangeable currency at the heart of our lives—it’s all watermelon sugar in watermelon sugar. It doesn’t quite make sense, but it feels true. Such games with definition are at the heart of Brautigan’s genius. The conceit of Trout Fishing in America is that “Trout Fishing in America” is a character, a friend of the narrator’s, or maybe a pen or a hotel—or possibly also someone known as “Trout Fishing in America Shorty.” As the narrator tells us the story of his life—a childhood friend, a fishing trip, a woman and a baby taken on hiking and camping trips—the mystery of Trout Fishing in America enlivens the mundane. Fishing might do that, too, or a concept of America might. The work is so loose and light that the reader has plenty of space to wonder. 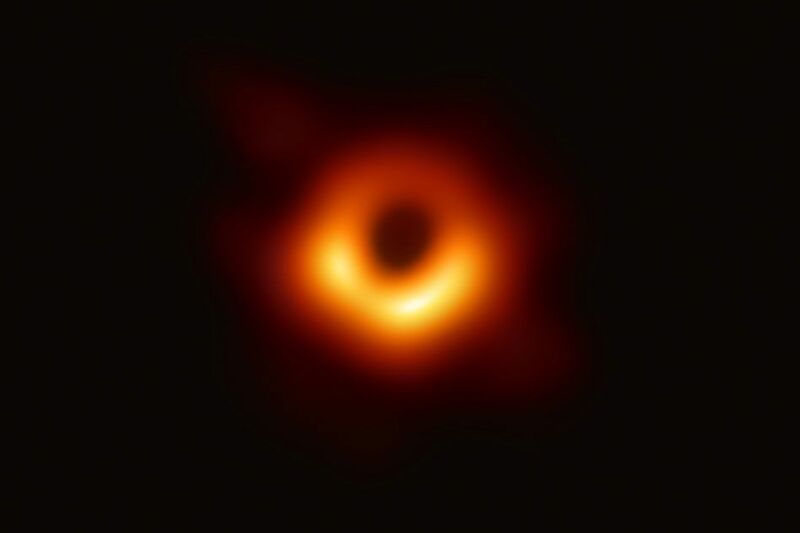 could be a beautiful poem. 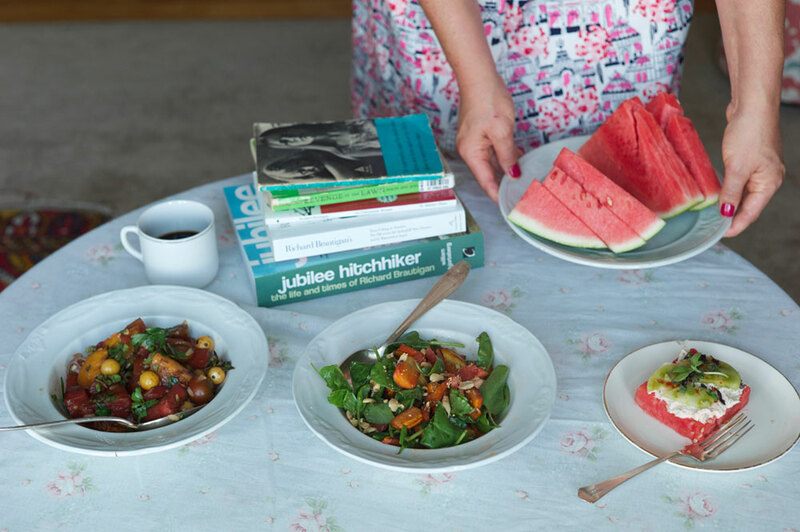 Because of my sentimental attachment to watermelon sugar, I ignored other possible menu items and made three watermelon dishes for Richard Brautigan, capturing the very end of the melon and stone-fruit season. 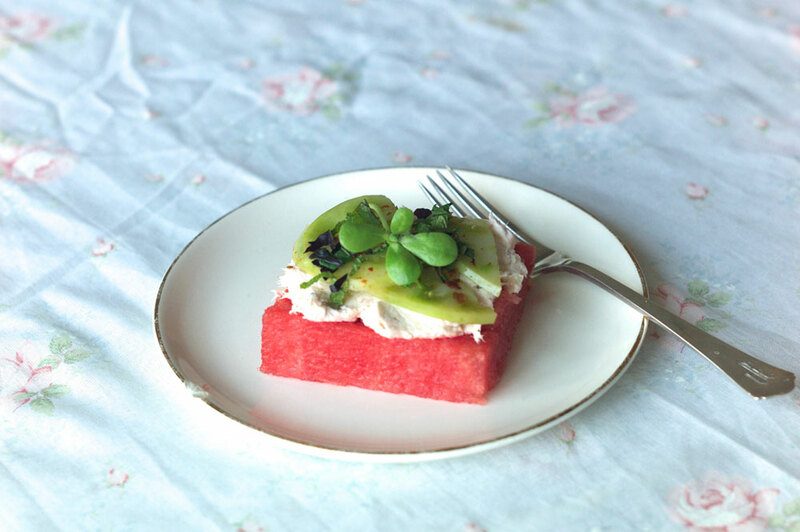 I made a fancy-looking watermelon-and-smoked-trout salad, riffing off (and vastly simplifying) a Food & Wine recipe. Next was a late-summer salad of grilled peaches and watermelon, dressed with balsamic glaze and fresh herbs. Finally, I created a smoked-trout-and-sorrel salad, with carrots glazed in watermelon syrup, and a watermelon-syrup dressing. I don’t know if Brautigan ever actually cooked them, but his two favorite ingredients turn out to be delicious together in any combination. 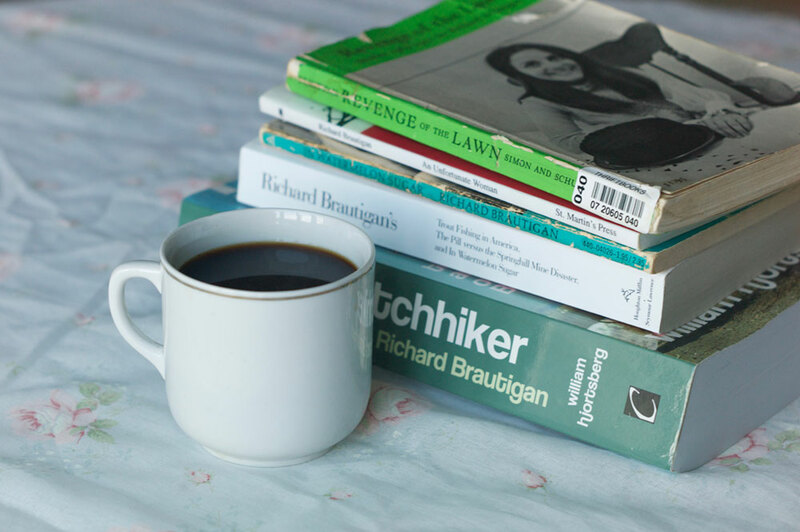 Brautigan also loved coffee. A short story called “Coffee” in the collection Revenge of the Lawn begins, “Sometimes life is merely a matter of coffee and whatever intimacy a cup of coffee affords.” I took this as an opportunity to share, in our gourmet coffee–crazed culture, my solution for New York City’s simplest and most affordable cup, brewed at home. I did not sweeten it with watermelon sugar, but you could. Using an ordinary filter coffeemaker, use 1 tbs Café Bustelo espresso-grind coffee for every cup of water. Bustelo costs $4.39 for ten ounces, about ten dollars less per bag than today’s gourmet alternatives. 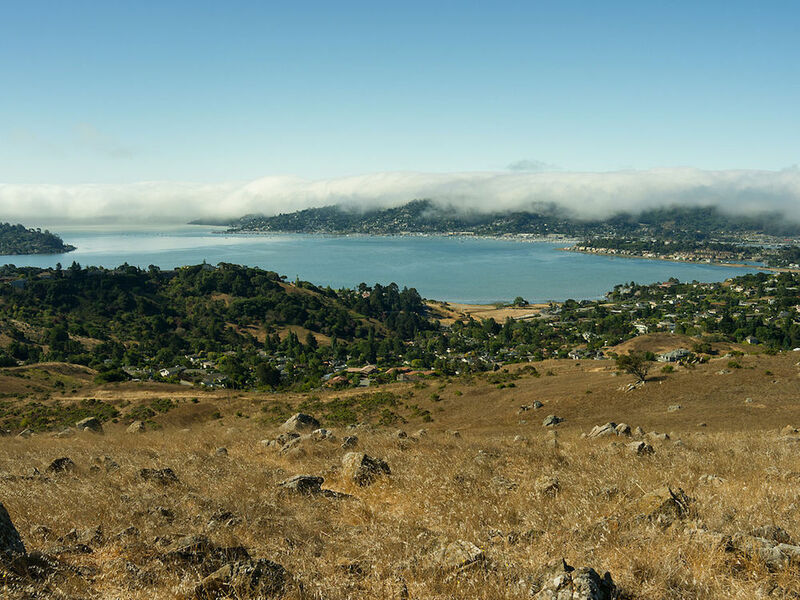 No more steps—you’re done! Make the pickled green tomatoes. First, make the brine by simmering the rice vinegar, water, sugar, and salt in a saucepan until the sugar has dissolved. Do not bring to a boil. Let cool slightly. While the brine is cooking, slice the green tomatoes very thinly, and then quarter. 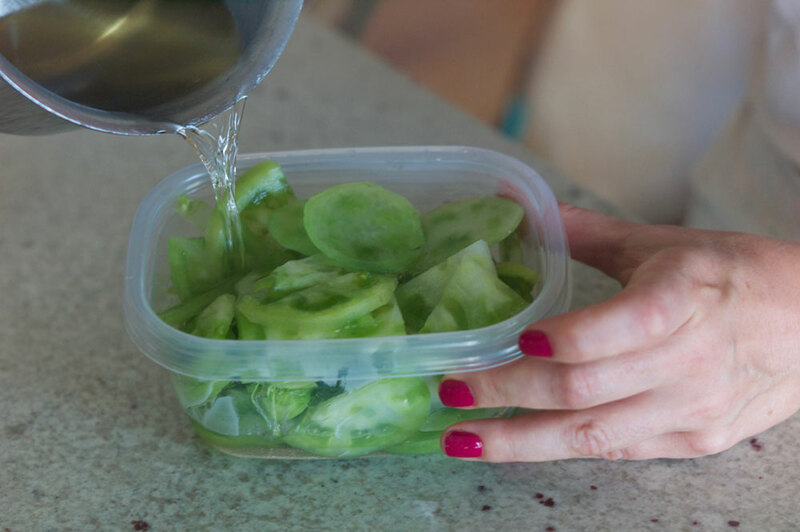 Put the tomato slices in a heat-resistant container that has a cover, pour the brine over, and let sit for at least thirty minutes before use. Make the goat-cheese-and-smoked-trout spread. First, combine the goat cheese, lime juice, salt, and coriander in a small bowl. Stir to combine. Add water, 1 tsp at a time, to create a softened, spreadable consistency. The mixture should be smooth but not runny. Add the smoked trout and stir well to combine. Slice the watermelon to create four 3-inch squares, about 1 inch thick. Spread each square generously with goat-cheese spread, top with pickled tomatoes, mint, basil, and purslane. Sprinkle with red pepper flakes. Serve immediately. Make the balsamic reduction. Simmer balsamic vinegar in a small pan until reduced by half. 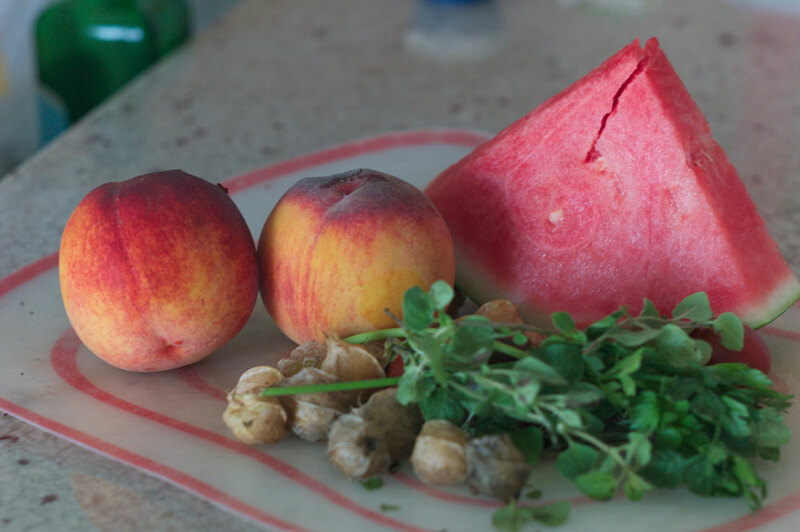 Prepare the peaches and watermelon for grilling. Halve the peaches, then cut through the halves vertically, so you have a total of four thick slices from each peach. 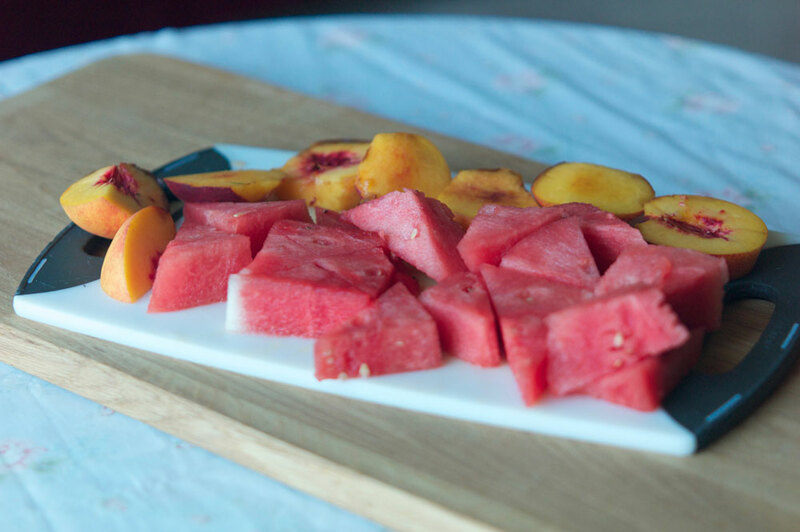 Brush peach and watermelon slices with olive oil and cook on a very hot skillet or on a grill for three minutes per side, until the fruit is browning and beginning to caramelize. Chop the grilled fruit into bite-size pieces and drain in a colander for twenty minutes or until ready to assemble. 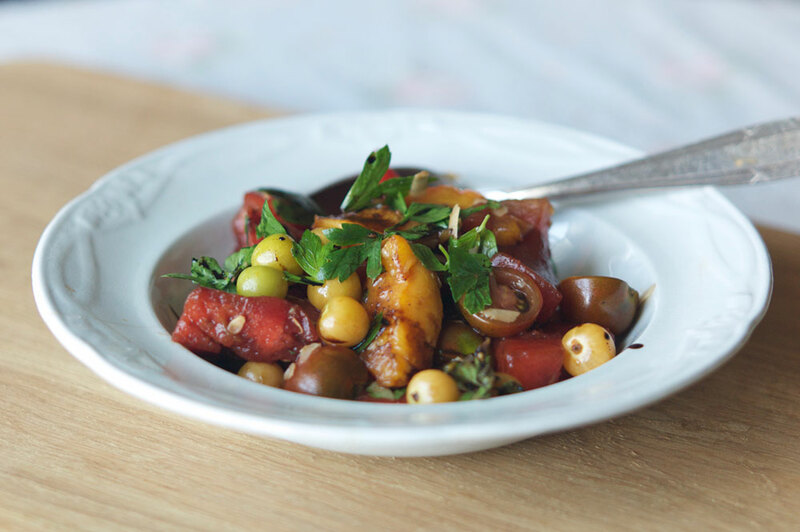 Toss together the cherry tomatoes, ground cherries, parsley, and oregano. Just before serving, combine with the grilled fruit and parmesan cheese, and toss. Drizzle with balsamic reduction, spritz with lime juice, and add salt and pepper to taste. Make the watermelon syrup. Remove the rinds and cut the flesh from 1/2 a large watermelon into chunks. Puree in a blender, then strain. Combine the strained liquid with 1 cup of brown sugar in a medium saucepan, and bring to a boil. Simmer for thirty minutes or more, uncovered, until the liquid is thickened and reduced. Make the carrots. Preheat the oven to four hundred degrees. 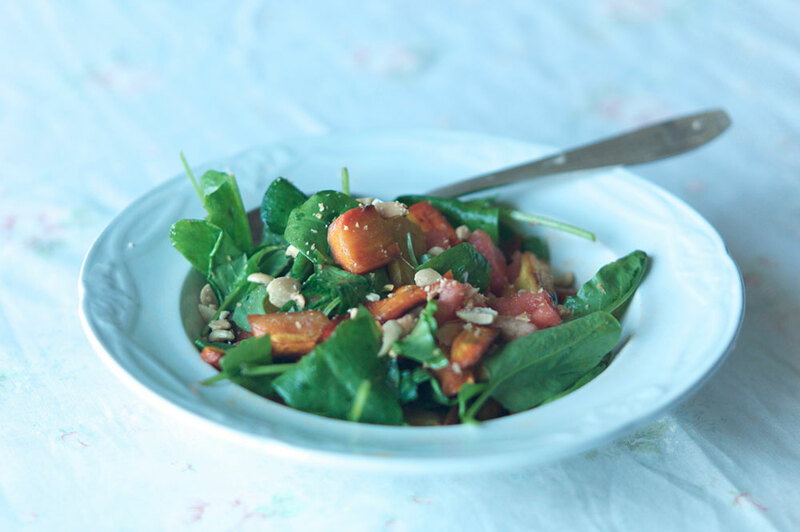 Toss the carrots with olive oil, salt, cumin, and watermelon syrup in a glass baking dish. Roast at four hundred degrees for one hour, tossing every twenty minutes. Turn off the oven and let sit for fifteen more minutes to dry out and caramelize further before removing. Make the dressing. 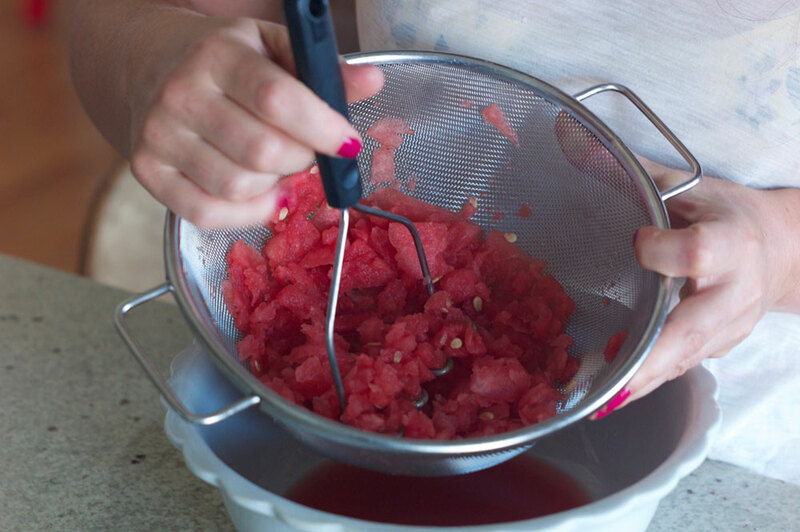 Combine olive oil, lemon juice, watermelon syrup, and salt to taste in a small bowl. Whisk to emulsify. To assemble, toss the sorrel, smoked trout, and carrots together in a medium serving dish. Top with the dressing and crushed almonds, and adjust seasoning to taste.